As a sports fan, it’s frustrating to watch Olympic events that have subjective scoring, such as gymnastics and my favorite, synchronized swimming (Is that really a sport?). It is so much easier to determine winners and losers where the results are objective, like in swimming and track and field. Similarly, in law, it is easier to advise clients where the rules are objective, such as “Maintenance terminates on remarriage.” Where the rules are subjective, such as how long and how much maintenance should be paid, the “scoring” is highly subjective and much, much more problematic. It’s rare that a discretionary order, such as maintenance, is reversed on appeal. It’s even rarer that the Wisconsin Court of Appeals goes to such length in reversing the order that it takes special concern to assure that on remand, the prevailing party on appeal can have a new judge hear the matter. Both occur in the recent appellate court opinion in Lemke v. Lemke, No. 2011AP1974 recommended for publication. Ricky and Lisa Lemke were married in 1983. Except for a very short time when Lisa worked at a fast food restaurant, she didn’t work outside the home. In 2005, shortly after the divorce was filed, Lisa and her children were involved in a serious automobile accident. The parties were divorced in 2007. They stipulated all issues except the questions of child support and maintenance. 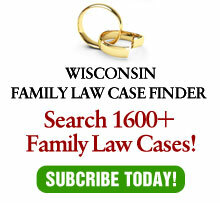 Rock County Circuit Court Judge John Roethe awarded significant family support for three years. Just before the three-year period passed, Lisa moved to extend the family support order as permanent maintenance. By this time, Roethe had retired and Judge Kenneth Forbeck was assigned to the case. Forbeck concluded that Lisa’s family support should terminate with no maintenance. Lisa appealed. The District IV Court of Appeals found that Lisa was entitled to permanent maintenance, as Ricky failed to provide medical evidence which challenged Lisa’s medical evidence. The only vocational evidence the Court of Appeals determined to be relevant and credible was testimony that Lisa was unable to sustain employment and that this inability was permanent. The vocational expert whom Judge Forbeck found credible considered Lisa an able-bodied person, capable of unrestricted activities with the exception of being a nurse. Reserve Judge Charles Dykman’s decision for the panel determined that this opinion was without substance because it contradicted the only medical testimony. The court noted that though appellate interference with a trial court’s credibility determination is rare, Forbeck’s credibility determination was clearly erroneous. As a result, the court reversed, with instructions to set permanent maintenance. In addition, Lisa asserted that Forbeck erred by using his personal experiences with ailments he believed to be similar to hers as a basis for his decision. The Court of Appeals determined that the only possible relief for her complaint was through the use of Wis. Stat. § 801.58(7), which allows a party to file a request for substitution of judge on remand. Judge Brian Blanchard’s concurrence agreed with the majority’s decision in all respects, except for the issue of substitution. Blanchard’s argument was that neither party raised the topic of substitution. Therefore, he would leave potential substitution issues, if any, to the parties on remand, and to the circuit court as issues might arise, rather than leaving it up to Lisa to decide if the issue she identified was significant enough to require a substitute judge when the case was remanded. Perhaps the most interesting aspect of this case is the effect of the judge’s personal experience. Most orders in this area of law are discretionary and only reversed if outside the range of discretion. That range is highly subjective and one judge’s sense may differ remarkably from another judge’s feel for that range. It is precisely fear of that unknown subjectivity that causes lawyers to recommend compromises as settlements to their client. Since the law allows judges a range of results, the personal proclivity of the judge necessarily plays a role. A female judge who took a six-week maternity leave before returning to the bench might very well reach a different answer than a male judge whose wife stayed home with the children until the youngest started school full time. Is either outside this subjective range of reasonableness? Probably not, but the order may very well depend on the judge’s personal experiences. Another example is the effect of alcoholism on maintenance. In DeLaMatter v. DeLaMatter, 151 Wis. 2d 576, 445 N.W.2d 676 (Ct. App. 1989) the Court of Appeals held that refusal by an alcoholic spouse of medically recommended treatment is a relevant factor in the court’s maintenance decision. Yet, in Hacker v. Hacker, 2005 WI App 211, 287 Wis. 2d 180, 704 N.W. 2d 371, the court distinguished DeLaMatter by finding that the wife did not refuse treatment for alcoholism, but that treatment had not been successful. Since every treatment plan for alcoholism includes a requirement to refrain from using alcohol, wasn’t the wife’s use of alcohol in contravention of her treatment plan equivalent to a refusal to cooperate with treatment? Would it surprise anyone to learn that the judge in the Hacker case had a relative who struggled with alcohol issues? With human dynamics being as complicated as they are, courts need to have wide discretion to allow orders to fit the individual circumstances of each case. In doing so, judges, being human beings, are going to bring their personal life experiences into play as those experiences shape their beliefs and philosophies. When they go too far is very much a subjective judgment call, much as in gymnastics or synchronized swimming. The only solution for lawyers who advise clients who “play” in areas of grayness is to find compromises and reach settlements, rather than the risk the personal proclivities of the assigned judge.